The Comforts of Home makes it clear that home is about far more than where you hang your hat, be it an official uniform cap or a disguise. For Simon Serrailler in his self-doubt and anger, “home” for recovery at first is on the island or Taransay, off the British coast, swept by fierce winds and storms. Staying with friends who won’t pry into his grief (although their sweet young son wants to know all about the new prosthesis), Simon builds a set of protective walls, postponing decisions, walking, visiting with the locals. To be with his own family would be too intense, and he’s not yet confident of his working self, that most crucial component. 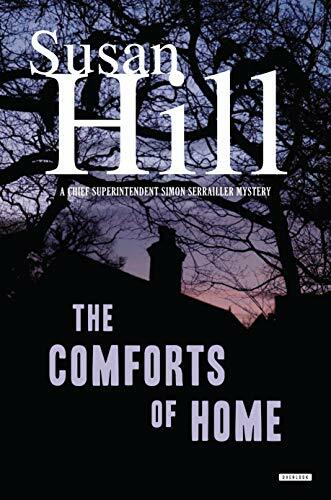 Although Hill’s books are well known as award-winning crime fiction, The Comforts of Home can’t be read as a page-turner: It’s too dense, too probing, too layered with pain and loss and the kind of love that family and good friends provide in the middle of life’s major messes. As the best mysteries do, this one probes the mysteries within, especially the interaction of an investigator’s own inner darkness and that of the criminals he pursues. At stake: Can Simon Serrailler pull his personal and professional lives back into a whole person? Or must he see himself as crippled by the only career he’s embraced? While it’s not necessary to read the earlier titles in the series first—this one’s compact and well planned—some threads don’t quite tie together without more of Simon Serrailler’s backstory. So it’s worth going to the others after reading this powerful ninth in the series, and appreciating the growth of Susan Hill’s own fusion of the personal and professional, the interior and the complex plot maven. A fine read, memorable and satisfying in its dark tangles and solutions.